Yesterday... wait I'm blogging two days in a row now? Hmm... Anyways, yesterday I posted the details of a recent trip to Kansas City with my mom and my sister. We hit a bunch of thrift stores and spent the night up there then hit an Antique Mall before we headed home. I should mention the reason I picked the weekend we went was because Kansas City had a Sunday Night game meaning less traffic Sunday morning, and Mizzou had an away game, so I-70 shouldn't have been too busy. It also was the weekend my other sister would have turned 41, so I felt it was a nice way to have a family outing and honor her. I had it all planned out, nothing could have been a huge event in KC that weekend that would cause traffic delays. If I waited a week, NASCAR had a race at Kansas Speedway and that would not have been fun hitting that traffic, so all was good... except... Ed Sheeran had a concert at Arrowhead Stadium the night we went. I also found out that the Foo Fighters had a concert the night before at Sprint Center. I guess that would explain why some of the hotels were sold out. We also heard a wedding that weekend caused the hotel we stayed at to become sold out. Possibly more on that in a bit. Anyways, with more back story, let's dig into more adventures from the trip. Again, not a lot of gummi bears in the tube, so I should have got the regular packages for her. Oh well. I also bought a new mouse for my laptop since mine has gave me fits lately. It's taking some getting use to, so for now I'll keep using the one I have. I didn't take a picture of the mouse though. I also didn't take a picture of the headphones I got either since, well, most headphones look alike. Something I did take a picture of though was this which I never heard of before. I'm conflicted on if I'm going to drink it. On one hand I kind of want to, but on the other hand I'm not big on energy drinks, and this one contains guarana which gives me terrible headaches. I bought it though so my options are drink it or display it. I'm also tempted to give it to a friend since he's a huge Simpsons fan and likes energy drinks. That seems like the best option, but if I do try it I'll tell you how it tastes. I'm sure it can't taste any worse than Steven Seagal Energy Drink which was a real thing and tasted horrible. After this stop, it was around 2:30 and we were tired and quite hungry. Mom and I hadn't ate all day and my sister ate around 7 that morning, so it was understandable. We were close to the antique mall we planned to hit, and not far from the hotel we booked, so I gave directions to a local Sonic since it was either that or McDonald's and they were next to each other. There were other options, but I figured we'd keep it simple. So we stopped in and ate, and I have to be honest, I passed up Chick-Fil-A for Sonic and that was tough for me since its been about two years since I've been to Chick-Fil-A. Anyways, I had a chicken sandwich at Sonic, and it might have been one of the best ones ever. I would dare say it was as good at the chicken I used to eat when I worked at Wendy's. As we left Sonic we noticed a car that made us all laugh. Not so much the car, but what was on the BACK of the car... JUST MARRIED! Hmm, I guess half price Ocean Water's are too hard to pass up, even on your big day. When we left, we decided to check into the hotel since we could and figured at least we could rest a bit and if we wanted go to the Antique Mall later since it was open until 9 PM. As it turned out, we just decided to stay at the hotel and rest. My mom I think wanted to watch Mizzou anyways (which she later regretted, though I told her no way they'd beat 'Bama). My sister and I did head out once more to go to a local grocery store across the road from the hotel. We was curious since it was a Price Chopper and it had been over two decades since we last been in one. They are a sponsor of the Kansas City Royals and on the side of the building was a giant "statue" of Alex Gordon with his glove outreached over top of the building as if he was trying to catch a ball. I guess I should have taken a picture, but oddly enough my camera stayed in its case most the weekend. Nothing else really happened that night and we woke up in the morning and got ready to leave when I was flipping through the channels and noticed a movie was on I wanted to see. It was Three Billboards Outside Ebbing, Missouri and while I didn't catch the ending, I saw enough to know its on my list of movies to purchase. As I gathered my stuff and watched the movie, my sister took her stuff out to the car. When she came back she had a big smile on her face... YOU HAVE TO COME DOWNSTAIRS AND SEE THIS. Take your camera. It turns out a celebrity stayed at our hotel that night. Well, kind of. We didn't see them, but we saw their car, and honestly that was better than seeing them. No it wasn't Ed Sheeran. These guys took the time to do it right. Its tough to see but on the dashboard you can see half a pack of cigarettes even. 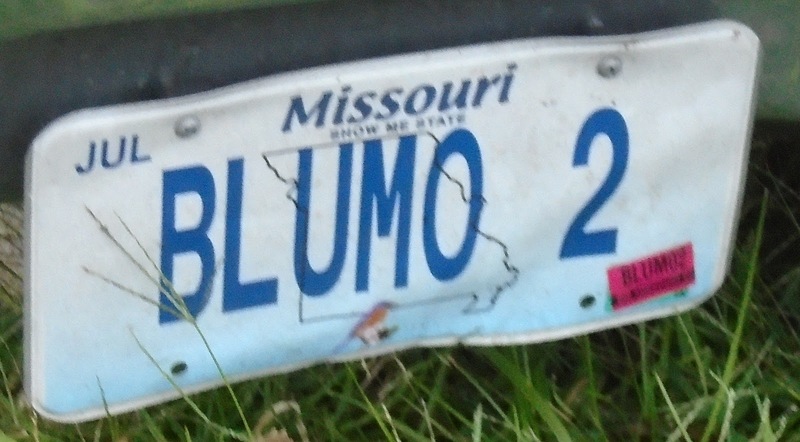 This implies there is a BluMo 1 out there somewhere, which is pretty cool as well. We wondered if they was there for the wedding that was the reason the hotel was sold out that night. If it was, that would have been an awesome wedding. This sh**box Dodge even had sunglasses in the back. This car has everything! When I got home it took a couple days but I found out what this was about. It wasn't there for a wedding, but the guys who own this go to car shows and actually have another car (I assume BLUMO 1) and a couple other replica cars as well. 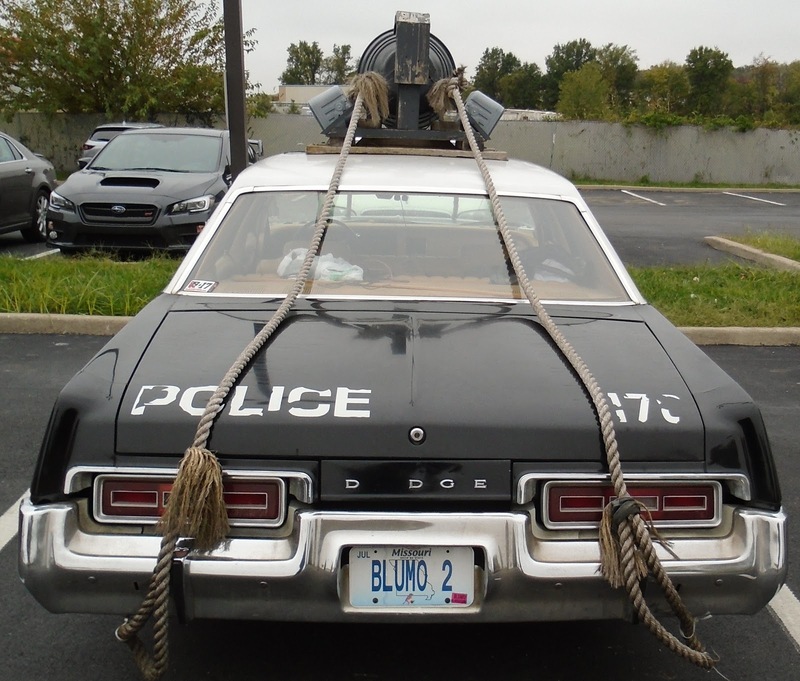 They ones that drive this one dress up as Jake and Elwood and even perform as a band (either as just the duo or the whole band with the horns). I can't remember the site now, but it was fun to look at. I might look into going to a car show if I know they will be there. So after seeing this, we knew this trip was worth it. We also had one more stop left. Now I could tease what I got for next time, or just show it now. I think I'll mostly show it now. We made a trip to the Brass Armadillo Antique Mall and it was as good as I remember it. While we didn't spend much, it was still fun to check out. Though to be honest, I was still tired from the day before, so after this besides rain coming in we were trying to beat, I was ready to get home. I didn't really take pictures like last time. In fact I took three total once inside, mostly for reference in case we went back soon or in case I wanted to look them up on Ebay. I liked this tin can of Pringles, as it was jumbo size and would be a nice display for Christmas. I forgot the price but it was a bit more than I wanted to pay, plus I already have tins I can't display so a large one would be tough to show off. I never saw a wooden cheese box before. The price wasn't bad, but it was not very stable, I was afraid to move it because I thought it would fall apart. It would have been fun to get and use to store cards though. This brought back many memories from childhood and to be honest I really wanted it, but I couldn't justify getting it. I forgot the price, but this falls into the "wasting money if I ever hit the lottery" category, and right now its good enough just having this picture. So you may wonder what I bought. Well, let's see. Yes, I went 100 miles from home to buy a Larry The Cable Guy DVD. To be fair it was cheap, and I was able to check to see if it was scratched. It was pristine and I have actually wanted this movie for a while. Sure it's nowhere near as good as the original, but I still enjoyed it. Plus its not like I'll watch it all the time, once a year is good enough. Plus in all honesty Santino Marella was a better actor in this than Larry. This was a publication from the Kansas City Star from 1985 after the Royals won the World Series. I have a few collectibles from the 1985 series, but never saw this before and it was cheap so I got it. Maybe one day I'll try to make scans or just take pictures from what's inside. It's a pretty good book. I'm pretty sure I've said this many times, but growing up the Royals weren't on TV a lot, so most nights I would listen to the radio broadcast, and it was always Denny and Fred. This book was 5 bucks and sealed in a plastic bag. It was a good price for the book, but I also hoped maybe it was sealed because it was autographed. It wasn't but I'm still happy with it. I also hoped there would be pictures inside of them in the booth, possibly in their chairs, one of which I am sitting in right now. That wasn't the case either, but I really need to start reading all these books I'm getting, right now this is about third in line so it might be a while. Three dollars worth of packs. Here's the deal, a quarter a pack, inside each pack was 25 cards. So all I had to do was find a card I liked on the top of the pack and whatever was inside was just extra. I got more football then I thought, but still it was worth it. Next time I'll show off the packs, not every card, but a few from each pack including every top card. More packs! Well, team sets to be precise. I was hoping to knock out some team sets on this trip, and even considered making a stop by a card shop, but I figured there is always next time. However I made a list of what I had for the most part, but knew I didn't have these completed yet. I'll show them off next time, but I will say the two on the right weren't exactly complete, but that's fine, missing one or two from a team set and paying under a buck for 20 or so cards isn't too bad. The '03 set on the left was complete, and I can add it to the other Police sets (well, Kansas City Life Insurance) I have. Another pack of cards, this one ALL Royals. I could have got more, but I thought this was more than enough. Plus I didn't see any other packs that grabbed my attention. All in all everything I bought at the Brass Armadillo was under 20 bucks and it was a blast. Like I said, next time I'll post what cards were inside, and I've already scanned them, so it might be soon. So as we left, we noticed the rain beat us to the metro, but we already planned on heading home. It took a while, but eventually we got ahead of the storm, and made it back faster than I thought. When we got home, I had one more surprise. So did my mom, turns out she had flowers waiting for her. I had a coin pouch (two actually, one I gave to my sister) and a gaggle of stickers. A website I frequent- Gottadeal.com sent me a package for taking part in a contest that has run this entire year. They are my go to site for Black Friday shopping. This year they are celebrating 15 years, and I've been there since about year two or three. Back then I was really into Black Friday shopping, now days not so much, but I promote the site as much as possible because they are pretty nice and I usually win free stuff every year on the site. I think I have about 9 or so shirts from the site, all won via contest. I might have more, but its always fun to have something to wear. So that wraps it up for today, I know this was a long post, but I had fun writing it, and next time should be fun going through the cards I got. By writing these the last couple days, it has cleared up some backlog of posts, so who knows, maybe I'll write more often again. We'll see. Thanks for reading and have a great week. Thank you its been pretty fun writing them. I usually don't post my face online much anymore but I have a few times on here in the past. 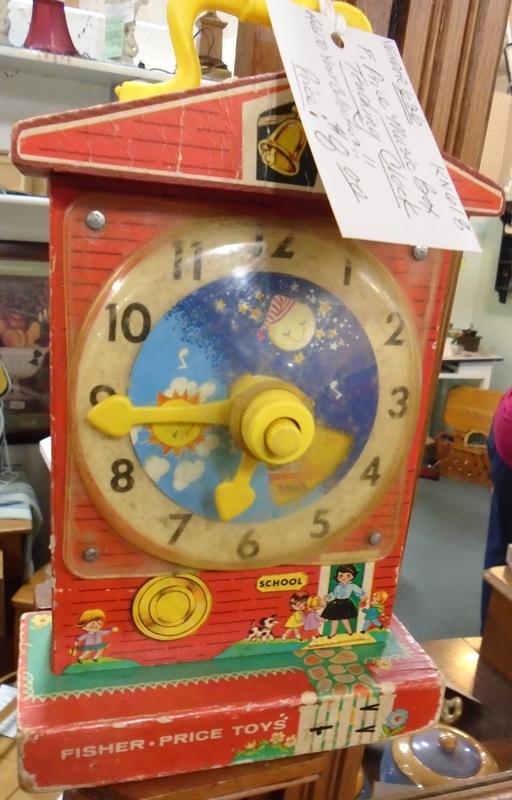 One of the deciding factors on the toy was the condition, if it was nicer I probably would have gotten it.